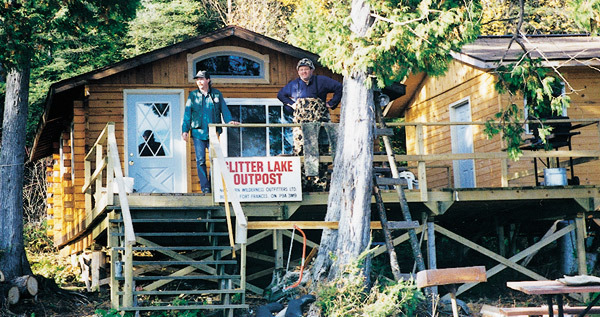 Glitter Lake | Northern Wilderness Outfitters Ltd. This lake is located 145 miles northeast of our airbase and takes a little over an hour of flying time to get there. Glitter Lake is about 6 miles long and about 3 miles wide. We have built a comfortable log cabin on the north end of this lake and it can accommodate parties of up to 8 fishermen. We have the only cabin on this lake and it is well equipped with everything you will need on your wilderness fishing trip. Glitter Lake is noted for its fast walleye action, a chance to catch a trophy northern, and some smallmouth bass thrown in for a little extra excitement. For the fishermen who do not have a lot of fishing experience we suggest giving this lake a try because you do not need to be an expert fisherman to catch all the fish you want on this lake.